After a particularly stormy start to Spring, the Mediterranean weather arrived just in time for us to begin rigging in London Docklands for a very special and unusual event. We had been approached by Smyle Creative to produce a display for the Christening of Viking Ocean Cruises’ latest ship – the Viking Sea. The ship arrived in London at midday on 5th May to great fanfare; sweeping up the river through the Thames Barrier, past the O2, Canary Wharf and Greenwich Royal Naval College before reaching its mooring next to the Cutty Sark. 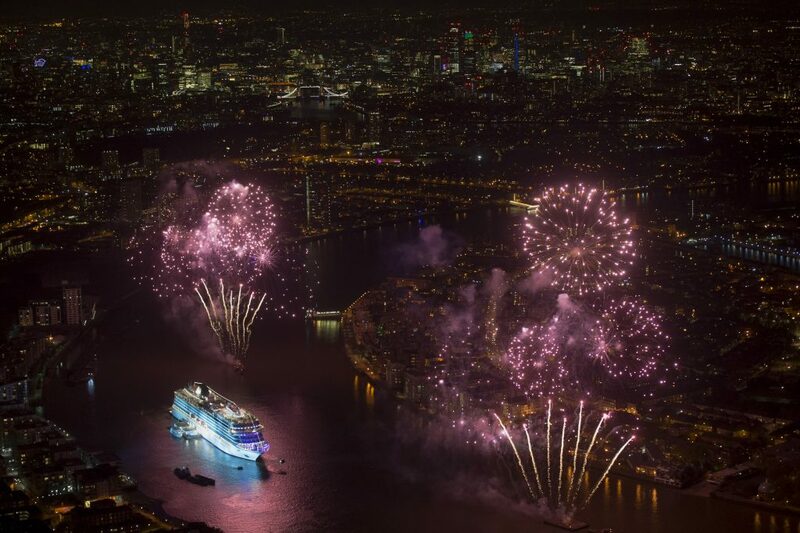 At an incredible 225 metres long, the 930 passenger cruise liner was the largest ever to be Christened on the Thames so we needed to produce a spectacle on a commensurate scale. 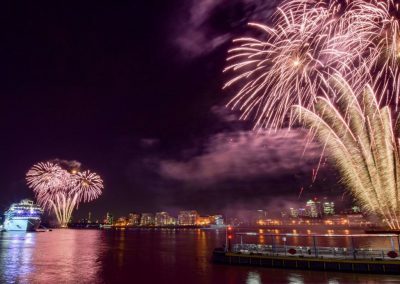 The display was a 5 minute Pyromusical, encompassing orchestral pieces from Norwegian and British composers, which segued perfectly from a live performance by the acclaimed Norwegian soprano, Sissel. 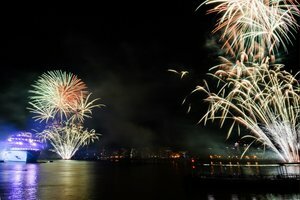 Regular firework displays are relatively straight forward to stage, as they are performed across a linear frontage for an audience viewing on one side. 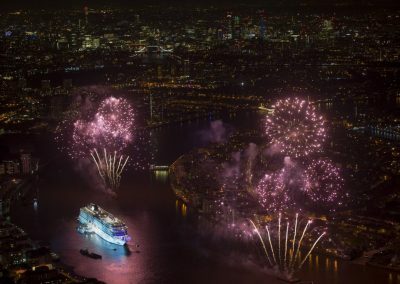 However, for this show we had to consider not just the live audience on the ship in the middle of the display, but equally the multitude of camera positions in helicopters, cherry pickers along the Thames and half a mile away in Greenwich Park. To achieve the necessary result we fired from two barges to the east and west of the ship, framing it perfectly against the London skyline. 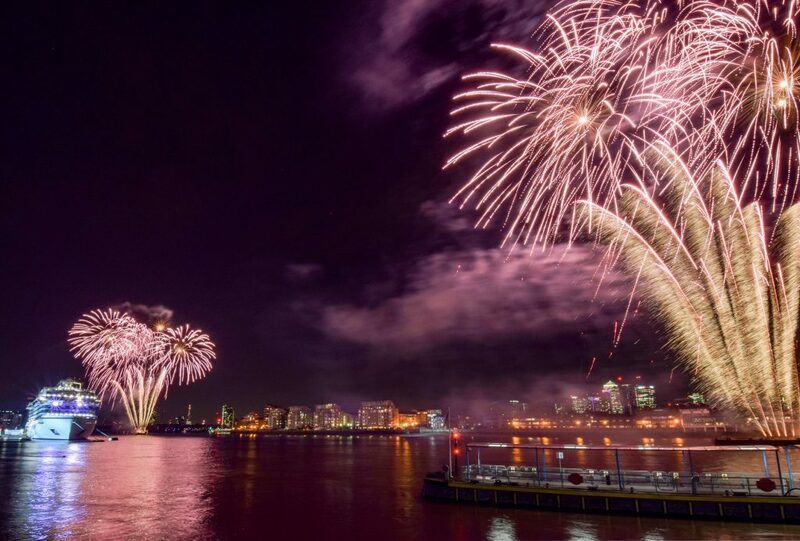 It’s always incredibly exciting firing a display for such a special occasion, and we are very grateful to the Port of London authority, the barge providers and of course Smyle for working with us to make it such a success. We wish all on board the Viking Sea a safe and relaxing onward journey!